To pardon or to punish? Children enjoying live stopped interpretation at the Tower of London. Photo courtesy of Past Pleasures. How does the use of unscripted, adaptive, historical interpretation boost the tourist experience? Right on the heels of our look at the Tower of London’s visitor engagement, (in session #1041,Engaging the Public with the Medieval World) we heard a paper from from Lauren Johnson, Research Manager for Past Pleasures, the oldest historical interpretation company in the UK who educate and entertain the public at historical sites, museums, on stage and and on TV. Johnson, who is also an author, historian and heritage consultant, oversees and produces research packs for the 80 interpreters who work for the company. Past Pleasures employs and works with actors, interpreters, educators, and historians. The interpreters come from a variety of backgrounds; educators, teachers, as well as actors who have a shared love of history and want to communicate that passion to visitors. What is Live Costumed Interpretation? Historical interpretation is an unscripted, adaptive method of presenting historical figures that uses first person characters to keep the public actively engaged at heritage sites. Live interpretation isn’t quite the same as reenactment or museum theatre, although it shares some commonalities. Live interpreters are usually given a specific character, and the visitor is engaged by becoming the actor’s ‘court’ or ‘petitioners’. Although the actor is given information about the character, they do not follow a strict scripted performance enabling them to interact freely with their audience. Past Pleasures has been working exclusively at the Tower of London since 1992, specifically in the medieval portion of the castle for scenes in Edward I’s bed chamber. They have been working at Dover Castle throughout the keep since 2009. Hampton Court Palaces – Live interpreter interacting with visitors. Photo courtesy of Past Pleasures. How Do the Actors Engage the Public at Historical Sites? At Dover Castle, visitor dwell time is longer. Guests can can spend the entire day just in the keep, therefore the stories the interpreters use run for a month. Past Pleasures uses stories that are by Marie de France, Chretien de Troyes, and medieval music that is designed to provide information. They have used Occitan, Latin, and English pieces that would’ve been heard at the courts of Henry II and Eleanor of Aquitaine. Stories also shift according to the seasons. There are “winter stories” for the medieval palace that connect with visitors in more low key ways. During the winter season, actors float around with more downtime and interaction with each other while visitors can just watch the scene, ask questions or move on. 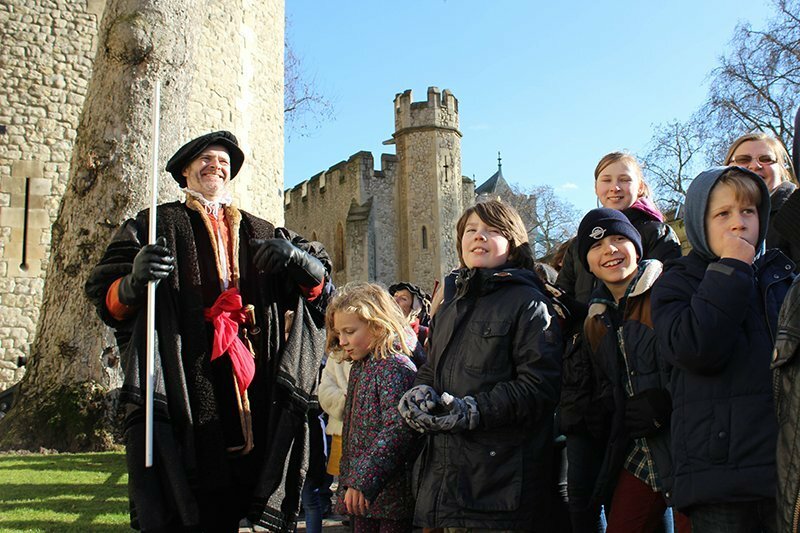 At the Tower of London, the winter stories focus on Edward I. At the Tower of London, the “summer stories” are packed into half an hour blocks of activities. The stories focus on the Wars of the Roses, and games like “Beat the Block”. Guests can choose the their faction and get a sense of empathy for the political times. For children, there is also a “Knight’s School” . Children go through knight school and learning about chivalry, and the activities of a knight and at the end they are knighted. There are varying levels of audience interaction from the lowest level, simply shouting, “God Save the King!”, to the highest level, dancing with interpreters and being singled out to participate in scenes. King Henry II engaging with children at Dover Castle. Photo courtesy of Past Pleasures. Johnson addressed concerns about live interpretation being, ‘a shallow, shiny pageantry, without much going on under the surface’. There is an inherent perception that live interpretation is a dumbing-down of history to make it easily absorbed by the masses. There is anxiety from historians with making all history ‘entertaining” in order to be quickly accessed in today’s fast paced, “entertain me now” world. Johnson argues that this isn’t the case, “If people engage with it, you will see so much more going on underneath, so long as it’s underpinned by solid research.” There is a great deal of research and preparation that goes into every performance to ensure it remains authentic and accurately reflects the period. Johnson noted that although entertainment like, “Knight School” might just be viewed as, ‘babysitting with foam swords’, it still engages children with history by making the educational connection fun. They learn and retain information about the period through participation. As heritage sites continually evolve, they look for new ways to interact with the public and for innovative methods to retain the interest in and importance of historical spaces. Live interpretation certainly isn’t just a bunch of people running around in costumes at a castle, museum or heritage site, they are historians educators who are passionate about preserving and sharing history and enriching the visitor experience.